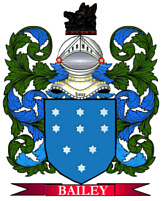 Coat of Arms: Blue with three gold gauntlets. Crest: A bull's head emerging from a crown. Motto Translated: Bring nothing base to the template. 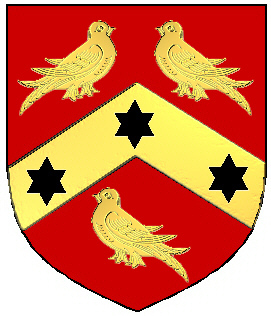 Coat of Arms: A red shield with three black mullets on a gold chevron, between three gold martlets. Spelling variations include: Finney, Feeney, Finnay, Finny, Fynnie, Fynney, Feenay, Feeny, Feaney, Feanay, Feany and many more. First found in Galway where they were seated from very ancient times, and where their territories were Ballyfeeney and in Roscommon. Some of the first settlers of this name or some of its variants were: Robert Finney purchased land in Virginia in 1716; and John Finney landed in Maryland in 1774; Robert Finney settled in Virginia in 1716; Ellen Finney settled in Boston Mass. in 1840. Mullet = Denotes some Divine quality bestowed from above. Martlet = (footless swallow) Symbol of the fourth son (mark of difference); may signify one who has to subsist by virtue and merit, not inheritance Martlet, Merlion or Martinet. Quartered with a crane and three dirks, each with a boar's head impaled. The name phinney originally appeared in Gaelic as O Fiannaidhe. This name, which was O Feinneadha in its earlier form, refers to a soldier. Spelling variations include: Finney, Feeney, Finnay, Finny, Fynnie, Fynney, Feenay, Feeny, Feaney, Feanay, Feany and many more. First found in Galway where they were seated from very ancient times, and where their territories were Ballyfeeney and in Roscommon.Some of the first settlers of this name or some of its variants were: Robert Finney purchased land in Virginia in 1716; and John Finney landed in Maryland in 1774; Robert Finney settled in Virginia in 1716; Ellen Finney settled in Boston Mass. in 1840. Coat of Arms: Gold and blue shield with an eagle and knight. Finney - Phinney Families in America: descendants of John Finney of Plymouth and Barnstable, Massachusetts and Bristol, Rhode Island; of Samuel Finney of Philadelphia, Pennsylvania and of Robert Finney of New London, Pennsylvania. 298 p.